Seoul Fashion Week 2018 is poised to join the ranks of the internationally-regarded shows in Paris, London, and New York. With the olympic games ending in Pyongyang only weeks ago and mounting tensions with the North, the world is focused on South Korea. A mere 30 miles from the Korean demilitarized zone there is no other place with a taste for the avant-garde and gender-flouting norms than young Korean designers. The standouts this season recall those from Spring 2018’s show, with the likes of Low Classic and 99%IS as well as internationally-renowned Wooyoungmi dominating the runway. Filling the runway with oversized jackets and deconstructed overflowing silhouettes, up and coming designer MAXXIJ celebrates liberty and freedom from the rules. Without being a total copycat, it recalls contemporary designers with a sportswear influence such as Vetements. If the young designers of South Korea do indeed turn a blind eye to politics, then perhaps saying nothing is a political statement in itself. In refusing to be dominated by fear or by force, MAXXIJ’s pieces express a personal freedom from the binary of gender and control, instead evoking geometric, architectural, and even asexual inclinations. 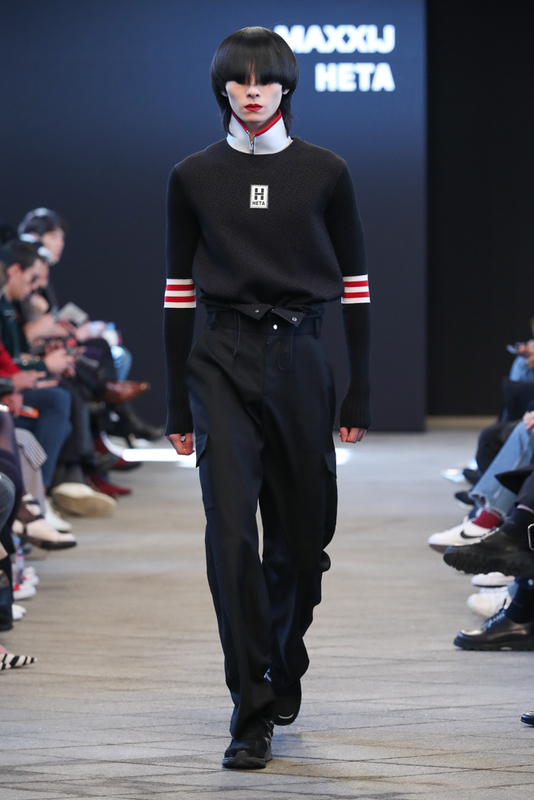 Another young talent, Hoyoung Chi, launched his unisex brand HETA (the greek word for the letter H) in 2016 after graduating from the Samsung Art & Design school. Emphasizing a ‘touch of the avant-garde’, HETA manages to mix a smart blend of refined sportswear style with subdued flowing silhouettes. Splashes of red contrast the restrained palette of grey and navy, clearly evoking high-end European brands like Moncler. It is evident that HETA is inspired as much by luxury as it is by youth subcultures. Sung-eun Kim’s brand, Tell the Truth, creates quality basics designed to last a long time. Tell the Truth brings a more feminine touch to Seoul Fashion Week 2018. The requisite trench coat this season is sophistically tailored in solid colours punctuated by a few pieces showcasing bright check patterns, bringing to mind vintage 90s Burberry style. The embellished, often gaudy logomania that has invaded fashion for the last few years seems to be giving way to a mixture of functional sportswear and elegant unisex apparel. Gender fluidity in streetwear fashion is as prevalent as it is on the runway, to the point where it almost seems unworthy of mentioning. Are we post-gender? Perhaps nowhere more so than at Seoul Fashion Week 2018. The conversation is more about mixing classic and avant-garde forms, rather than referencing specific elements of sexuality. Other styles from the street included more of the same from last season- matching couples, children’s high fashion, and Balenciaga accessories. If Seoul Fashion Week 2018 is missing a bit of something extra then at least it is consistent!